Sometimes in this job you think you have seen everything. Then something like this comes along. 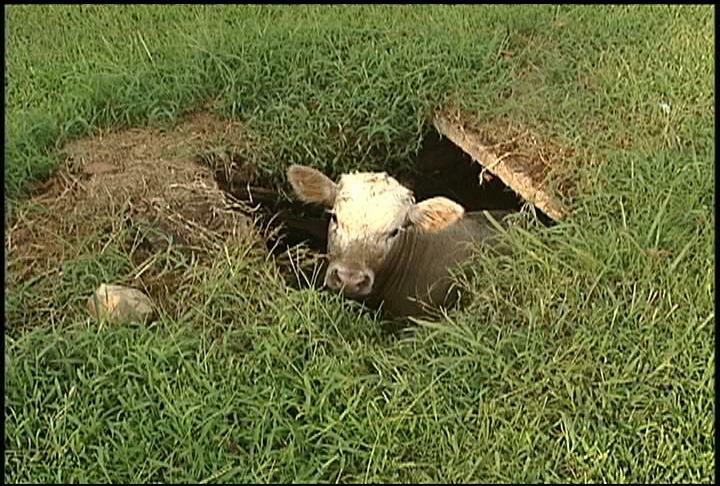 I'm on my way home on Friday(and why does it always happen on Friday) when the station calls about a cow that got loose in Albertville and fell into a septic tank. Yes, I asked "Did you say cow? In a septic tank?". So off I go to find the cow. In a septic tank. Sure enough, the cow found its way out of the pasture and travelling across a yard fell through the cap and into a septic tank. Albertville's animal control officer and a neighbor were out there trying to get the cow out. Finally, with the help of a police officer they were able to pull the cow out with a rope. You might think this is the end of a strange story. But now they had to figure out how to get the rope from around the cow's neck. And needless to say, the cow isn't very happy after spending the afternoon stuck in a half full septic tank. After 20 minutes of chasing and being chased by the cow, they finally were able to cut the rope and wrangle the poor, tired cow back into the pasture. And I, your intrepid photographer, get to add one more item to my list of things I thought I would never see. What going to happen nezt? Hey Brad that is really funny. Hey man, this is Chris Chandler, your old college roommate at JSU! Hope you & the family are doing great. That cow story sounds like something from around here!